It’s a bank right out of central casting. A grand bank from a different century: marble floors, travertine walls, Doric columns that soar toward a sculpted ceiling. In place of teller windows, a long bar, brass-wrapped and precision-lined with diners perched on elegant swivelling stools‎. In place of the manager’s office at the front, there’s now a private dining room for a dozen people. In place of writing desks and pens-on-chains, a thoughtful maze of shallow banquettes. Between the seats, bare oak tables are softly lit. At the back, where a safe may once have been, washrooms — even these keep to the same era, with their mint-green basins. The last, non-financial touches at the two-month-old Riviera are in the elegant, innovative lighting, the music that suits the room and period, the tall, glazed windows, and the playful artwork (a stag head wrapped with hundreds of wooden rosary crosses, by artist Rowan Corkill, dominates). Once filled with the hushed business of banking, the old Canadian Imperial Bank of Commerce at the east end of Sparks Street, now hums with the busyness of an open kitchen and a packed room and bar. These are managed, respectively, by Craig Douglas and Stephen Flood (Flood late of The Black Tomato, and creator of deliciously sophisticated cocktails, splendid in his Redouté rose apron). Riviera is the third restaurant in three years for the Matthew Carmichael-Jordan Holley team. (The other two, Datsun and El Camino, are, yes, also named for old cars.) This one – with design support once again from the gifted team at Linebox Studio – is their most ambitious project to date. “Here’s What We Have For You Today” announces the team’s one page menu. And will you look at that! Not a single sharing plate! The 10 or so starters roam here and there, with a particular focus on vegetables and fish. There’s a delightfully retro prawn cocktail, presented on Riviera monogrammed diner-style Doulton plates, the crunchy lettuce head halved and hollowed to hold a pond full of sweet, wild-caught Nordic shrimp. These are topped with a confetti of hard cooked egg and crisped bacon, dressed with an anchovy-garlic mayo. A mix of autumn carrots – some roasted, some pickled, some in rings and shaved ribbons – are judiciously sweetened with honey, littered with the Egyptian spice-seed-nut blend called dukkah, and served with a blob of whipped feta, rich and tart, and with a lovely barnyard flavour. The command of textures and flavours on this plate is exceptional. Slabs of Albacore tuna are set in a light, brisk, citrus-oil bath, kicked with mint and the sweet-perk of orange, the fish crowned with micro greens, wee petals, and twice-cooked quinoa. This contributes crunch to the soft fish – like toasted breadcrumbs, but slightly more exotic. 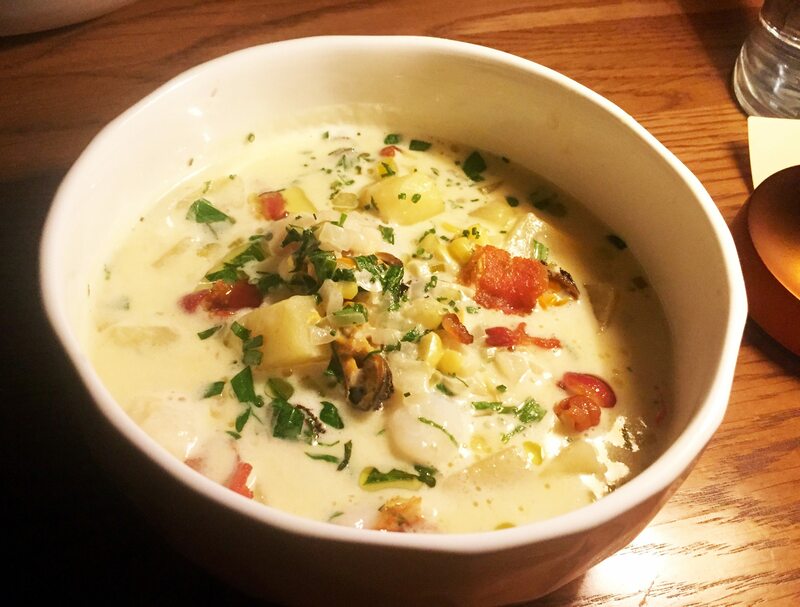 And then two dishes that had us purring with pleasure: scallops and corn, bacon, spuds, and spot prawns, united in a gorgeous chowder, and ling cod cheeks — crunchy-soft treats floating in an ambrosial lobster bisque. A light hunger would be satisfied with mushrooms on toast. 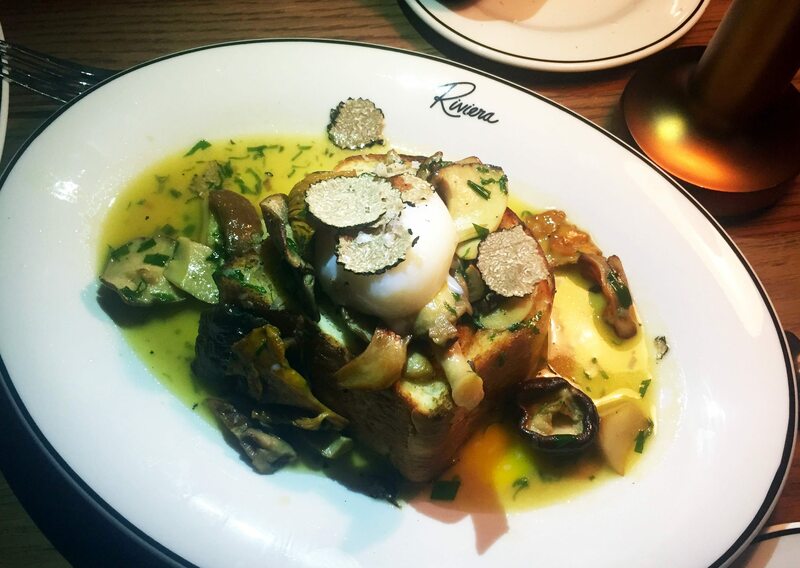 A fat slab of the house brioche, grilled and oiled, is mounted with a sauté of autumn mushrooms and the wobble of a perfectly poached egg. The dish is finished with a butter-herb emulsion and an aromatic shaving of black truffle that really boosts the mushroom flavour. Of the extruded pasta dishes tried, the orecchiette wins, with its chiffonade of herbs, specks of nutmeg, chips of garlic and crunchy-sour rings of pickled scape mingling and moistening the al dente pasta. It wins only because the lamb cavatelli, which features perfect pasta and lovely soft meat, was too aggressively salted. 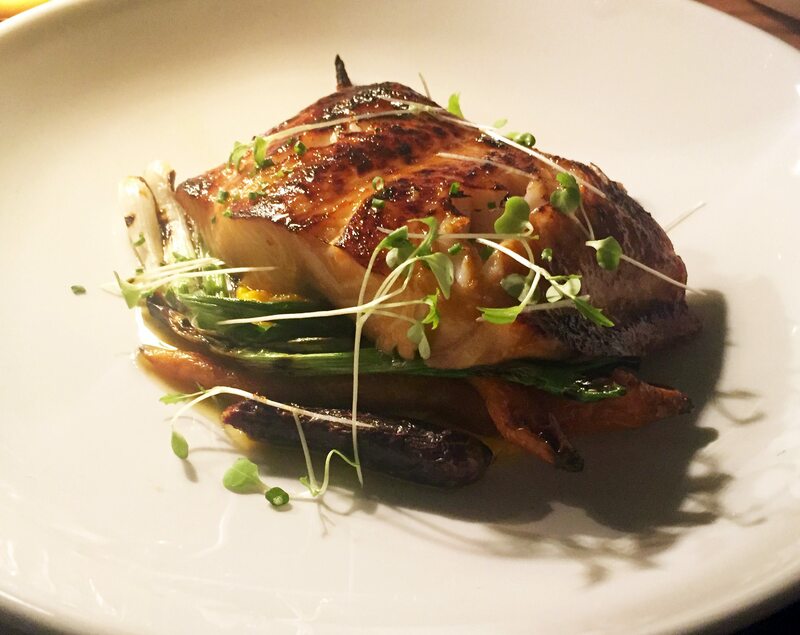 On the main front, Carmichael’s black cod makes an impressive return. It was a dish introduced at restaurant e18hteen, and a winner at the 2009 Gold Medal Plates. Here it arrives all bronzed and pretty, the fish timed perfectly, resting on a carrot-coconut purée imbedded with roasted carrots and charred scallion. Hanger steak is an easy, chewy-good pleasure, the frites tossed with salted, flash-fried herbs. Good too, the hunk of short rib, the meat pulled off the bone, propped up with a soupy-soft polenta. A dark pool of rich jus keeps everything moist and tasty. Ask for a spoon. Dessert? Yes, do. 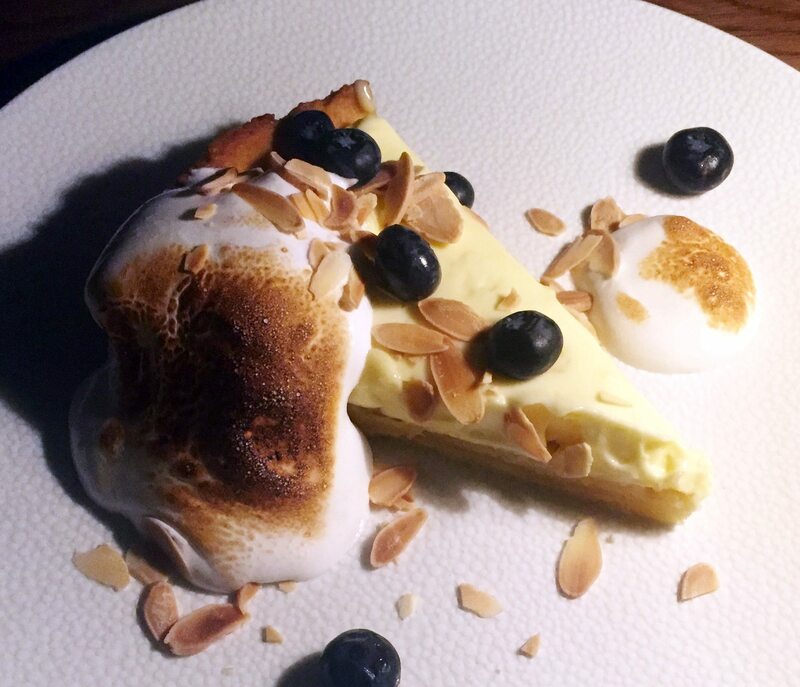 Either the lemon curd tart, sharp and creamy, on short-crumbly pastry that has a just-made crispness, topped with a brulée meringue, scattered with toasted almonds and blueberries, or the classic Eton mess, updated with a sea buckthorn berry curd, the shards of meringue poking out of a Champagne coupe. 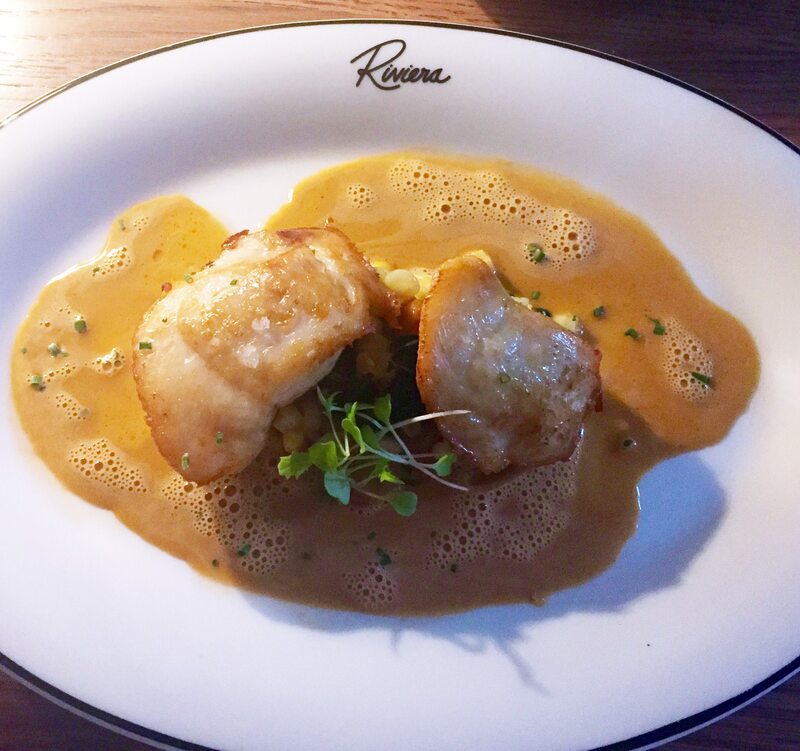 Riviera is an exciting, grown-up restaurant, glamorous but thoughtful, the cooking correct and ambitious, the drinks program classy, the wine list well assembled, and the servers – some who’ve come from the shuttered Hy’s – well trained and kind. 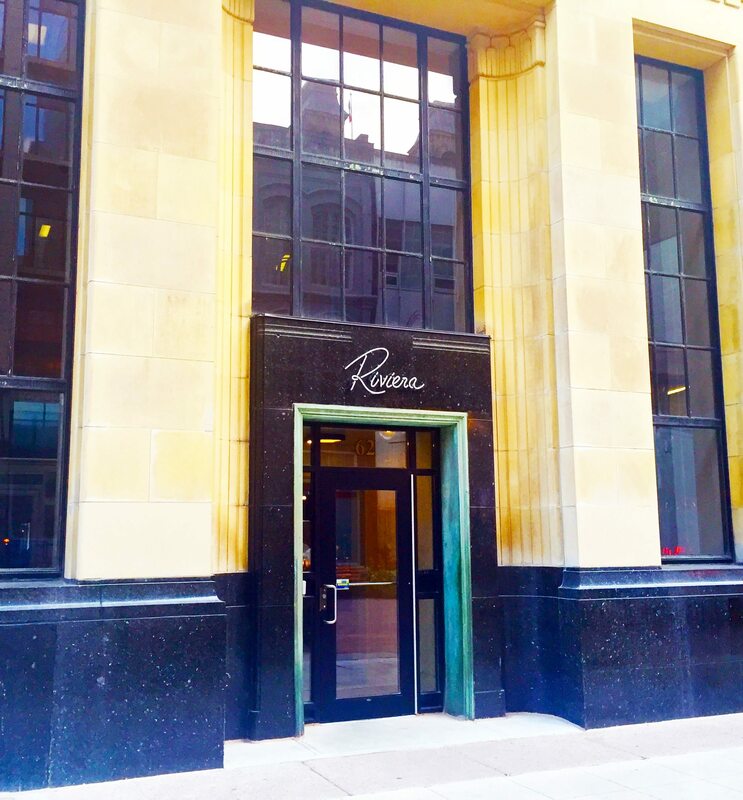 The team of Carmichael and Holley have just added lunch service – expanding Riviera’s ‘banking hours.’ I haven’t been, but I’ll go out on a limb and guess it will be a welcome addition to a downtown day.